Stay At Home Mum Loving It Blog - From Marketing to Mummy in the blink of an eye! 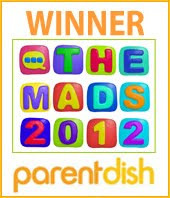 : The MAD Blog Awards Are Almost Here! The MAD Blog Awards Are Almost Here! I really can't believe it. 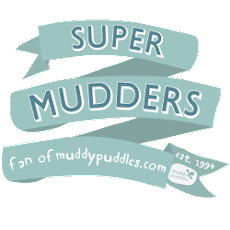 In 2 days time it's the Mum And Dad (MAD) Blog Awards in London and I'm going! Eek! I have no delusions of grandeur. I don't think for a minute I will win the 'Best New Blog' category but just to be a finalist is totally amazing. Never in a million years did I think I would be a finalist, especially as my family and friends were unaware of my blogs existence. Thank you SO MUCH again for voting for me! I didn't know if I would go to the awards as I live in North Wales so it's a fair way to travel, especially when you don't think you stand a chance of winning. I think I know who has won my category and a very deserving winner indeed, as are all the fabulous people in the running for each category. "Why would you want to go if you don't think you will win?" my husband said to me a few months ago. The answer to that question is easy. There are SO many amazing bloggers going that I can't miss it! It's a chance to see some friends I've met before and make some new ones and I'm so excited I could actually wee my pants (that's quite easy to do given my recent announcement). I'm also sharing a room with the utterly gorgeous Alex who, I not only hit it off with through blogging but, I fell in love with when we actually met in June. Sally and Jen have put so much hard work and organisation into the awards that it's set to be a totally amazing night. I've also been supplied a lovely dress from Ellos so, despite my ever expanding baby bump (it's seriously that big - I started to show at 5 weeks! - that a lot of my friends thought I was having twins) I should look reasonably glamourous for the occasion. For those of you who want to follow the action in a live blog on the evening you can log on to www.themads.co.uk/blog - the event starts at 6.30pm with the awards taking place from 7.15pm. Here's to all the finalists and a great evening! Remember to courtesy when you recieve your well deserved award! Heather I am so so so happy for you! Just seen your announcement post. I am sure mini cheddar will love having a baby to look after! Have a wonderful time at the awards. You deserve to be there as much as anyone else. Jane, my dear...were you that pissed on the Naked Wine at Cybermummy that you have forgotten we'd already met? Or maybe it's because meeting me last time was so unmemorable. I fear the latter haha. Was lovely to see you again. Also, do you realise this is the post I wrote a few days BEFORE the awards? I have written a summary of my take on the awards too - off to read yours now. Thomas & Friends - Day Of The Diesels, The Movie! This Has To Stop Now!